99 year old grandma, video game pro! – Nerdwatch! Nerdwatch! » cool things! » 99 year old grandma, video game pro! 99 year old grandma, video game pro! By Captain Nerd | July 23, 2011 - 2:12 pm | October 8, 2011 cool things!, Japan things!, neat things! So cool! 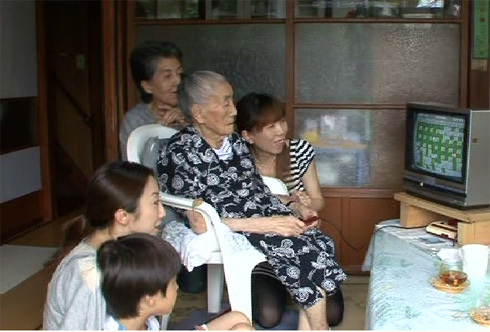 Umeji Narisawa of Sendai, Japan, 99 years young, plays her favorite videogame, “Bomberman”, like she has every day for 26 years! In Japanese, videogames are called “famicon” (ファミコン), which is Japanese shorthand for “family computer”, because it’s the computer that the rest of the family plays with, as opposed to the all-business PC (personal computer, pasocon, パソコン). Narisawa-sama first started playing the game after she saw her grandchildren having so much fun, so she tried it herself. Now, she plays about two hours every day, and she says it keeps her mind sharp and her fingers nimble enough to be able to thread a needle (see the video link, don’t worry about not understanding the Japanese, just watch the faces and hear the audience reaction). She has played so much, she can easily beat the game, getting to level 50 sometimes twice a day. Now, if you do the math, she’s 99 now, and she started playing 26 years ago, so that means she was 73 when she started! She’s proof that you don’t have to stop trying new things, just because you think you’re “too old.” It’s just a state of mind, and if you keep a young mind, you won’t really get old!